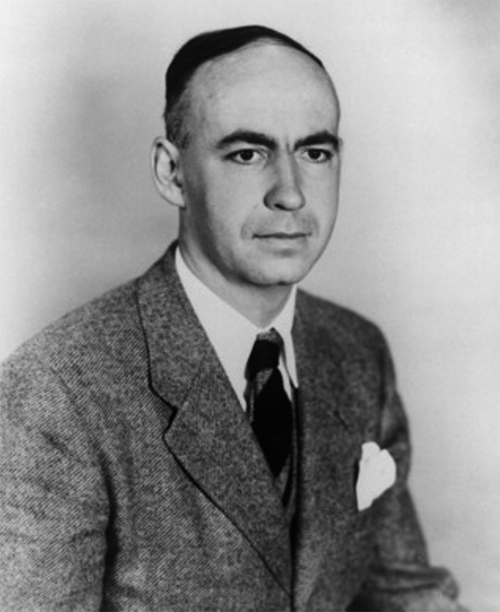 Robert Rowe Gilruth was born in Nashwauk, Minnesota, on October 8, 1913. His parents were Henry Augustus Gilruth and Frances (Rowe) Gilruth. Henry was born on a farm near Davenport, Iowa, in 1882. He became an educator and, at the time of Robert’s birth, was superintendent of schools in Nashwauk. Frances was born in Michigan on January 14, 1885. She worked as a substitute teacher. They also had a daughter, Jean Marian Gilruth, born in Nashwauk on February 5, 1911. The Gilruths moved to Hancock, Michigan, in 1919, where Henry became superintendent of schools. In 1923, they moved to Duluth. There Henry first worked as a chemistry, physics, and mathematics teacher at Morgan Park High School; he was promoted to principal of Morgan Park in 1927. In Duluth, the Gilruths resided in a home at 701 North Twentieth Avenue East. From fifth through eighth grades, Robert attended the Laboratory School of the Duluth State Teachers College, located in a building at 2205 East Fifth Street. Robert attended East Junior High School for ninth grade, and in tenth grade moved on to Duluth Central High School. At Central, he was active in the U.S. History Club and the track team and was president of the Math Club. He graduated from Central in 1931 and then attended the Duluth Junior College, which was housed in Duluth Denfeld High School, for two years, taking classes in chemistry, mathematics, and aeronautics. In 1933, he moved on to the University of Minnesota in Minneapolis. He graduated from the University in 1935 with a bachelor’s degree in aeronautical engineering and went on to earn his master’s degree the next year. Robert was hired by the National Advisory Committee for Aeronautics, the predecessor of NASA, in 1936 as a flight research engineer. NASA was established in 1958, when Russia was jumping ahead of the U.S. in space. Robert was named head of the team created to plan for sending a man into space. In 1961, Robert was appointed head of the new Manned Spacecraft Center in Houston, Texas. In that job, he supervised manned space flights, including the first Mercury flight and the Apollo moon landing in 1969. In 1962, he was awarded the Distinguished Service Medal of the National Aeronautics and Space Administration by President Kennedy. Duluth honored Robert on October 12, 1962, celebrating “Bob Gilruth Day” with a number of events including an assembly in the auditorium of Central High School where Robert said he was moved and humbled by the tribute. He returned to Duluth again in 1981 for his fiftieth high school reunion. Robert retired from NASA in 1973. He had married twice. His second wife was Georgene Evans Gilruth. He had one daughter and a stepson. His parents died in Florida—Henry on May 28, 1968, and Frances on May 4, 1973. Robert died in Charlottesville, Virginia, on August 17, 2000.